My ChurchSuite is the ideal way for church members to stay connected to one another and stay up to date on all that’s going on in the life of your church. Through My ChurchSuite, church members are able to update and manage their own personal details and those of their children, sign-up for events, join small groups, keep on top of the rotas they’re serving on and much more! Access to My ChurchSuite is by an invitation initiated from your admin-facing ChurchSuite platform, so you can easily manage access to suit your church context - some churches like to give early access to newcomers to help them integrate quicker, other churches like to wait until a person becomes better known - either way, My ChurchSuite is a great tool for better engaging congregation members. 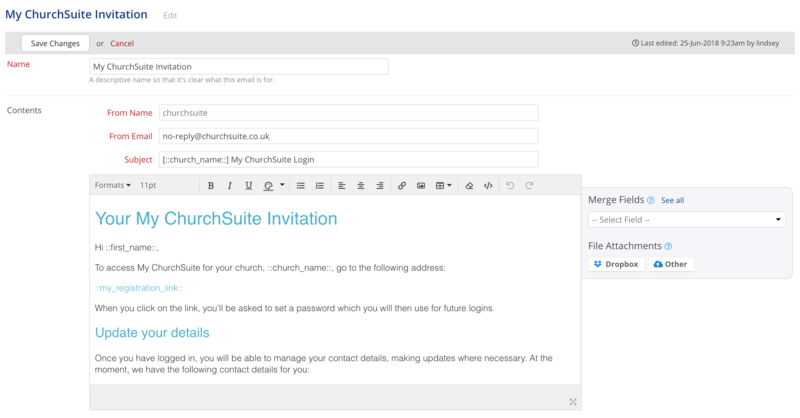 Importantly, the My ChurchSuite user experience can easily be styled for your own church - your church logo, colour style, custom menu names etc - providing a familiar experience to your church members, much like your church website and communications. My ChurchSuite is accessible by invited contacts from any web browser or using our free iOS or Android apps available from the respective app stores. If you have not yet enabled My ChurchSuite on your account, please ignore this article and refer instead to the Activate My ChurchSuite article first. 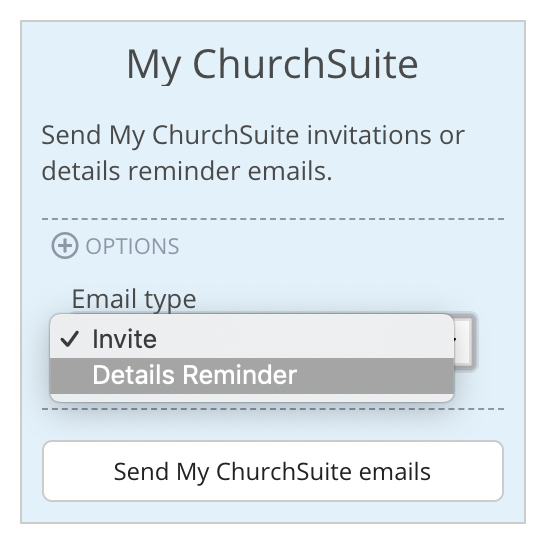 If you have already activated My ChurchSuite but are now looking to send email invitations to get your church members to use it, then you're in the right place - read on! My ChurchSuite is only currently available for adult contacts in your Address Book module. For safeguarding reasons we strongly discourage churches from trying to circumnavigate this by putting children contacts in the Address Book module. Apart from potential safeguarding and data protection issues, those children will be prevented from participating in the other Children module functionality - like check-in, medical/special needs/consents, groups and group attendance etc, or you will end up with duplicate children in two modules and risk having mismatches of personal data between the two child profiles. The My ChurchSuite invitation email can be customised if you wish. It's located in the email Presets in the Administrator section of your account. Customising the email body content is a great way to introduce the recipient to My ChurchSuite and why you're inviting them to have access! 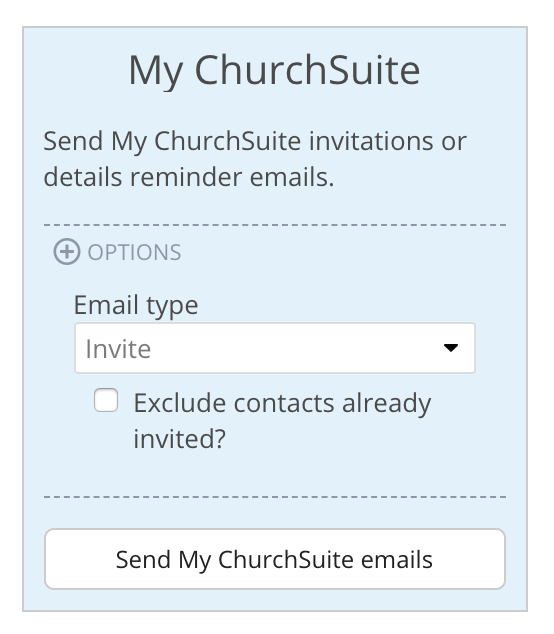 When editing the My ChurchSuite Invitation preset, be sure to leave the ::my_registration_link:: merge field in the body content of the email - without this, the system won't be able to embed the unique access link for each recipient being invited. The ::contact_details:: merge field is optional. Note: Invitations can only be sent in one of the two ways outlined in this article. Attempting to send the My ChurchSuite Invitation preset by any other method will result in the email not containing a valid, merged, registration link. To send a My ChurchSuite invitation email, contacts must have a tick against 'Allow My ChurchSuite login' so that it shows in green on their contact record. You can use the Communication Options report to alter this setting for multiple contacts by tag. To send an individual invitation, go to "Address Book" > "Contacts" and click on the name of the contact you want to invitation. Viewing the contact's profile, hover your cursor over the "My ChurchSuite" button and select Send invite from the drop-down menu. An email address is therefore a required piece of information in order for people to access My ChurchSuite - not only is the invitation sent to an email address, but that email address is used by the church member to login. Are you unable to see the My ChurchSuite drop-down button shown above? Probably My ChurchSuite isn't activated on your account after all - please refer to "Activate My ChurchSuite" support article. My ChurchSuite can still be accessed personally by couples who share the same email address. While their login email address will be the same, their passwords must be unique. Follow the above instructions for sending each partner/spouse a My ChurchSuite invitation email - those invitation emails are personalised. Each partner/spouse can respond to their own email in turn, clicking their personal email link that allows them each to set up their own unique password. 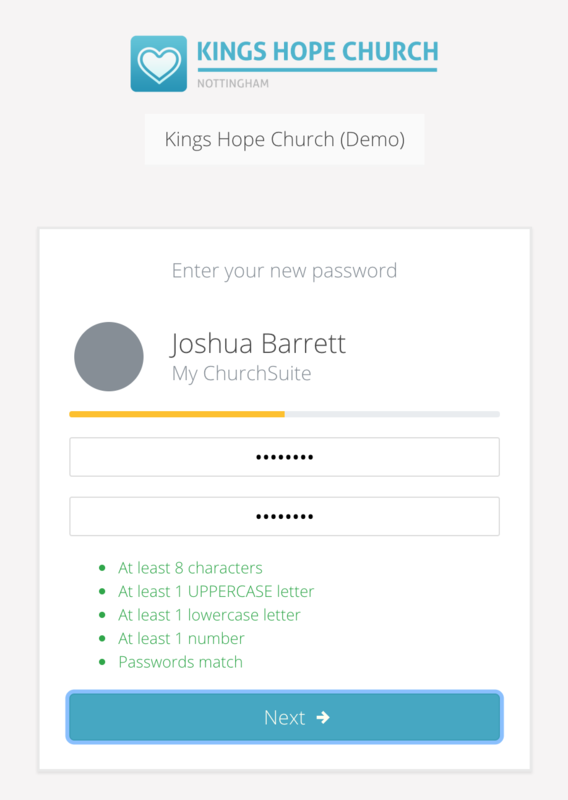 Now, when logging in, My ChurchSuite is able to determine which partner/spouse is logged in based on their email address and password; ensuring the correct contact profile and My ChurchSuite content is presented. Passwords cannot be shared, as the system will be unable to distinguish who is logging in. 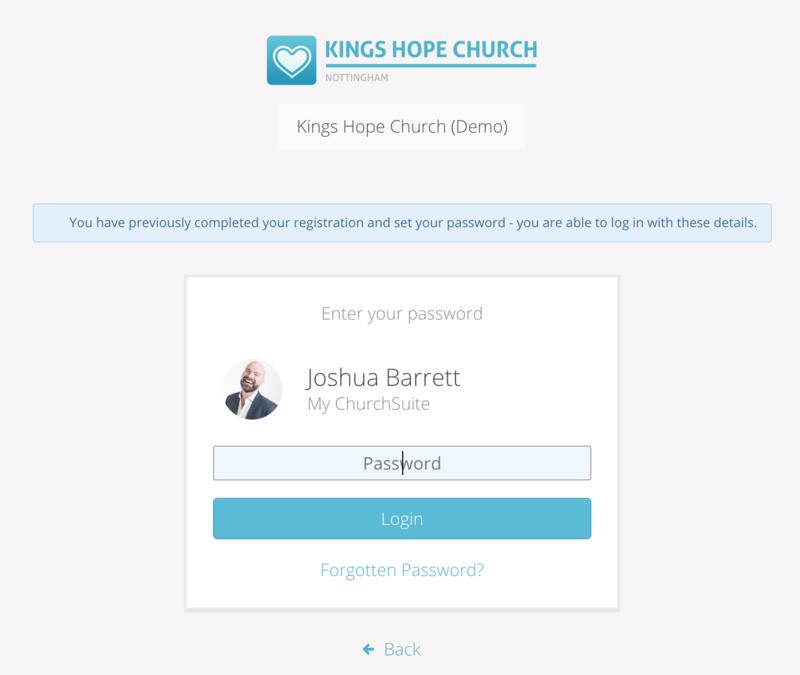 When the recipient clicks the link in their invitation email, they're taken to the My ChurchSuite registration page where they'll create their own password. 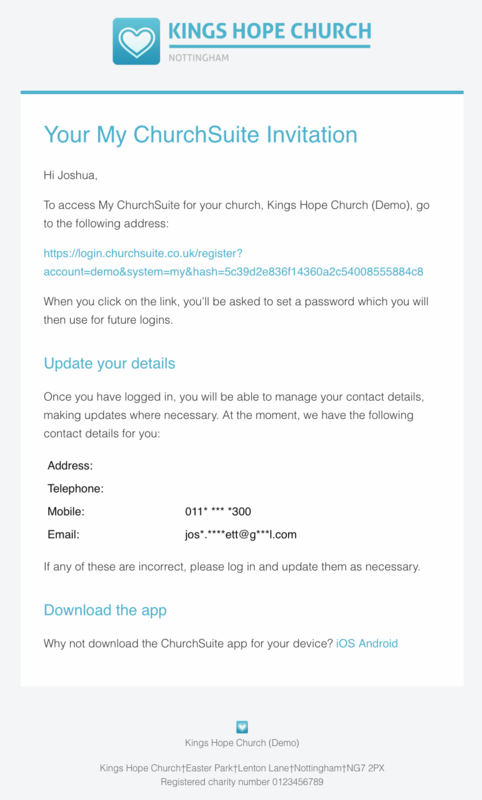 Note that the My ChurchSuite invitation email can only be used once - once the link has been used an a password created, the invitation email is defunct and can be deleted. After completing the registration process the invited church member is taken to their Home page within My ChurchSuite. To send invitation emails to entire groups in your church, or, maybe, even to all your church members, click on "Address Book" > "Communication". First, at the top of the page, select the contacts that you want to invite to My ChurchSuite - either "All contacts", a manual selection of contacts from your address book, or a choice of tags (tags are groups of contacts that can be set up in the Address Book). Next, at the bottom of the Communication page, locate the shaded box that says "My ChurchSuite". Clicking the Send My ChurchSuite emails button will send the email invitation out to the contacts you have selected (complete with log-in link). Note: The invitation also contains an excerpt of the data your Address Book holds for each person, asking them to update any incorrect details. Note also the "+OPTIONS", where you can optionally select to exclude contacts that have previously been invited. You can also use this method to send a Details Reminder email rather than an Invite. The only difference is that you need to click the "+OPTIONS" button, and then select Details Reminder under Email type before you click the Send My ChurchSuite emails button. Having sent invitations, the rest of the church member process is as described in the previous section. In addition to the Recent Logins and Inactive Contacts reports located within the Address Book module's reports section, we've also provided some really useful Smart Tag conditions to help you monitor and manage the My ChurchSuite usage of your church members. When using a Smart Tag, located in the Address Book module conditions are options for Has My ChurchSuite Login, Invited to My ChurchSuite and Last logged in. Using these conditions you can build Smart Tags with conditions that identify Address Book contacts who have (or have not yet) been sent a My ChurchSuite invitation, or those church members who have last logged in to My ChurchSuite in the past X month(s). For example, creating a Smart Tag with the condition Invited to My ChurchSuite = "No", you could then use the "Address Book" > "Reports" > "Communication Options" report to identify contacts who have My ChurchSuite login enabled, and filter by your Smart Tag to show only those who have yet to be invited to participate. Similarly, you might build a Smart Tag that identifies Invited to My ChurchSuite = "Yes" AND Last logged in = "Never".